DPx Gear Heat Hiker FREE SHIPPING! The DPx HEAT Hiker is the scale-less version of the DPx HEAT Fixed and features a carabiner for easy mounting to gear. It's the at-hand knife that doesn't get lost, dropped or misplaced. Made in the USA by White River Knife & Tool featuring S30V stainless steel in a stonewashed finish. 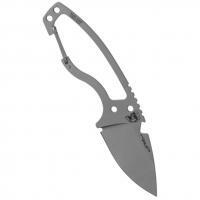 Comes with a simple black KYDEX sheath with lanyard and break away fixture for the option to wear as a neck knife. ©2002-2019 CopsPlus.com: DPx Gear Heat Hiker FREE SHIPPING!